Emergency Medicine - a complex of medical measures aimed at the treatment of life-threatening conditions. 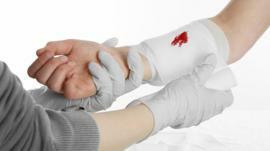 To to orient what to do in case of bleeding, necessary to realize that on your actions depends on someone's salvation. Emergency care at bleedings. The algorithm of First Aid.